At the beginning there was wonder. Or so the story goes, according to ancient wisdom, about the beginnings of philosophical enquiry. Then, there was one question mark – followed by another. A dialogue, or a disagreement. Two words, or maybe three. An eyebrow or a pair of shoulders raised. A laughter. An excuse. Some severe looks, a frowning here and there. Our Intro gang meets twice a week in the airy ground floor classroom, looking out to the quod, and we have a cocktail of everything – from wonder to laughter. One of the latest topics on the menu – reality. 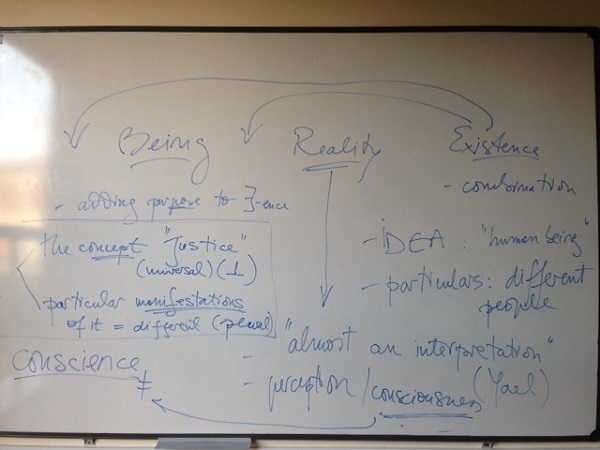 We spent a glorious first hour discussing what it may be, and how it might differ from being, or existence. Yael offered the cherry on the cake, when she said that, by contrast to being, reality is “almost an interpretation”. Luca and Aasim chipped in, with suggestions about what a difference perception makes, and how conscience differs from consciousness. It was, all in all, quite a feast. If only Sophia had been there, the joy would have been complete. But didn’t we all feel, at one point or another during the session, the touch of an angel negotiating its way amongst our chairs and desks?! I think every person has sort of inner fight between being and existence, as I think the difference between two is just to live ignorantly not concerning or getting involved in situations around whereas being is to live with a purpose or meaningfully and get active part in life generally. I think Matrix is a good example of how Neo was just existing and then how he decides to wake up and act, in other words, give meaning to his life. And reality in my opinion is when you not thinking of you past and future, that is the moment when you is you because at this time if you are thinking about past, you are going through different alternative options other than what had happened and if you are thinking about future then making some desirable options as how you would like everything to happen so I think during thinking about past and future you are sort of deviating from the present time. Life as a fight is … one way to look at it. Maybe not everybody’s and not the most adequate or even advantageous, but certainly functional and commonplace. But than the fight calls for a warrior, a meaning and a purpose, to “get active”. It also calls or implies a linear time narrative. It looks down on “just existing” as opposed to “waking up and acting”. All these views and behaviours may not be required to live a life but rather consequences of to literal an adherrence to a chosen(?) metaphor. I like how metaphorically explained what has happened during our class session. I suppose people in our group suggested a huge amount of interesting stuff to think of. I just want to add that for me the terms Being and existence are quite similar, while reality is a small moment, as usually during all our life period we are thinking more about future plans and decisions. It is very rarely when a person can realise themselves, enjoying in this particular moment his or her presence. Thus, for me it is quite sad that I could not concentrate and live my life right now (despite the fact that I am trying very hard) I cannot stop myself thinking about past moments or future ones. My conclusion is this: you only live in reality when you not thinking of you past and future, that is the moment when you is you, but the rest of the time you just exist, it does not actually mean that it bad to just exist, it is not. But in order to be in harmony with yourself and to be happy, each of us presumably should forget other periods of time and concentrate on fourth Huna principle named ‘Manawa’ (that is translated from Hawaiian: “w s the moment of power”).